I’m not sure if you guys know but I’m a HUGE Valentine’s Day fan. 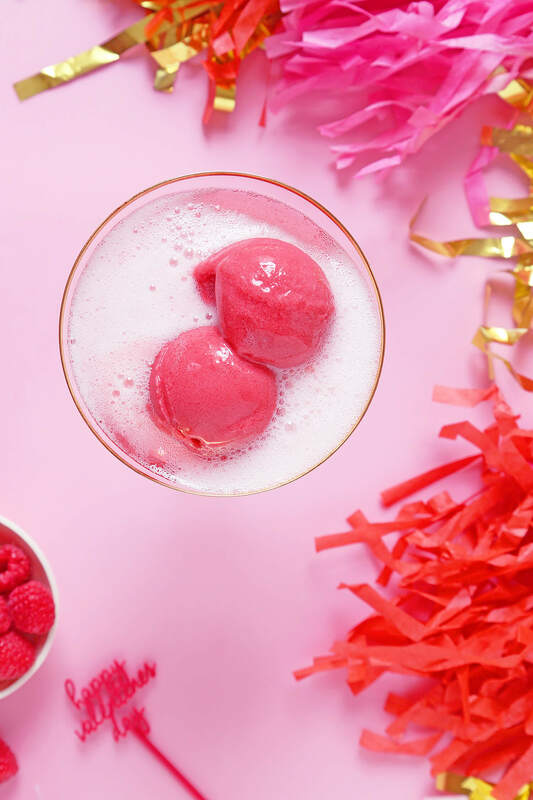 Any excuse to wear pink and shake up a cocktail (or bake) is the perfect holiday for me. The counterpart to V-Day? Well, it’s Galentine’s Day! 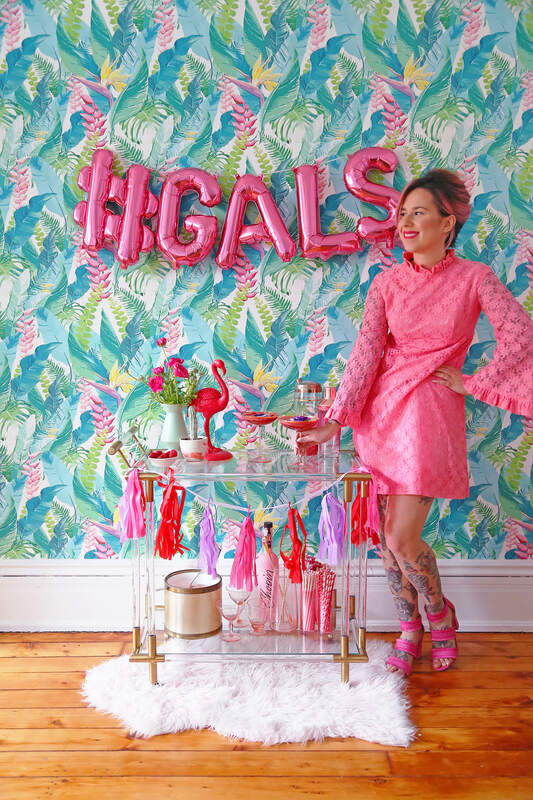 What better excuse to celebrate your fabulous self by getting together with your lady friends for brunch, drinking a cocktail or two, doing fun DIYs, and watching your favorite romantic chick-flicks. I’ve come up with the perfect Galentine’s Day brunch cocktail that’s both easy and delicious. 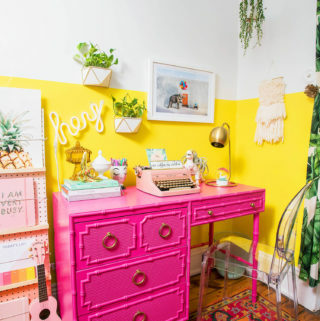 No party would be complete without a fun bar cart set up either. 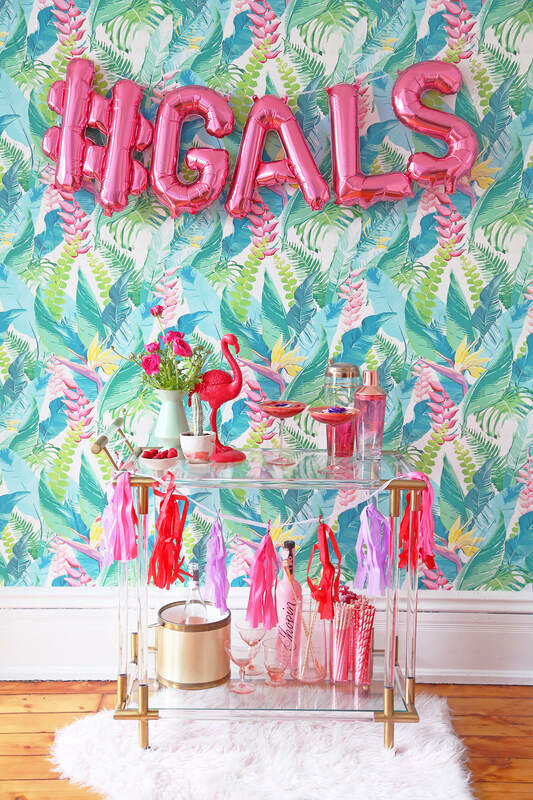 I got the #Gals banner and garland from Target for $3 each. 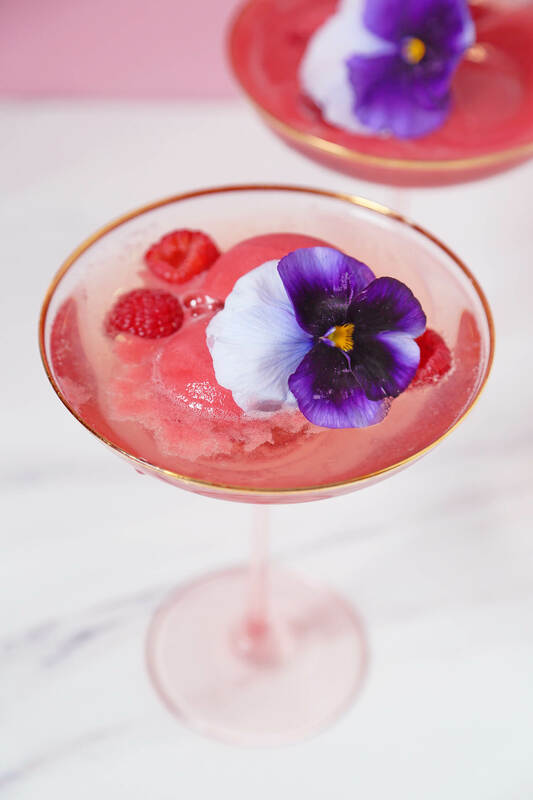 These raspberry sorbet bellini’s are so easy to assemble and makes them the perfect entertaining cocktail. 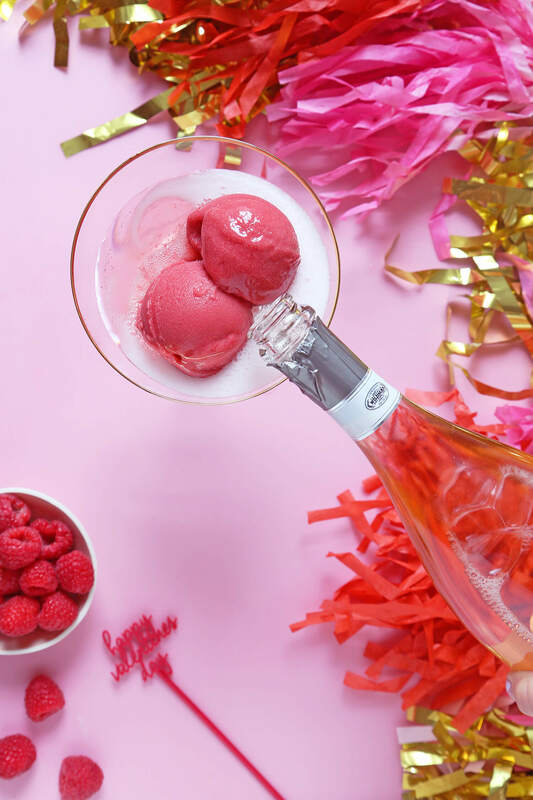 Simply scoop the sorbet into a champagne glass and add 1/2 oz. 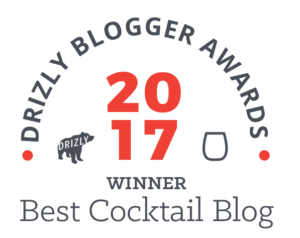 of elderflower liqueur and then top with the sparkling rosé. 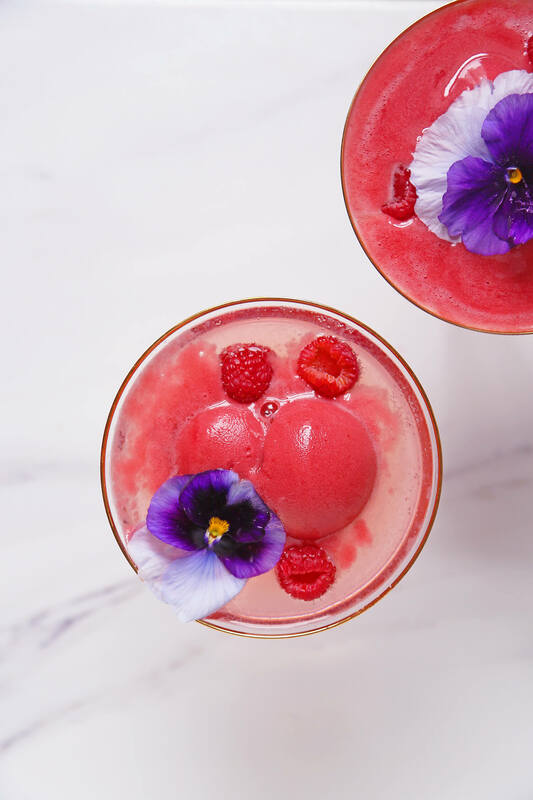 Garnish with fresh raspberries and an edible flower garnish. 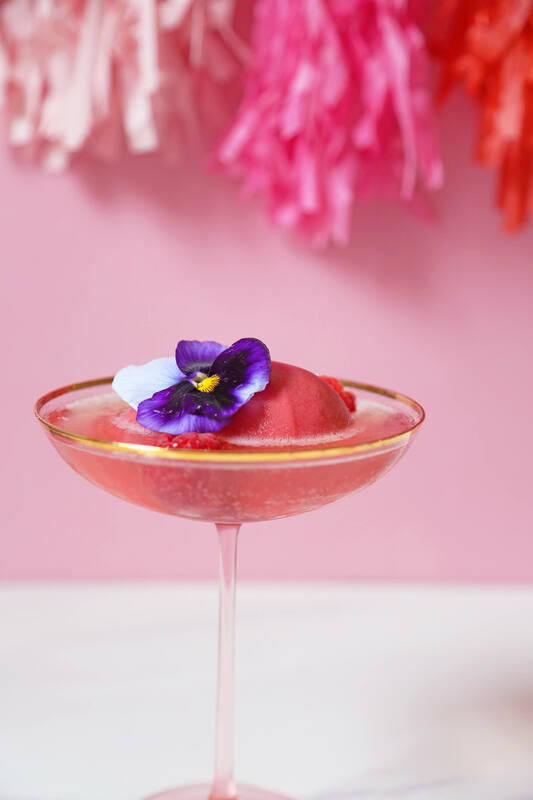 I have a feeling you will be drinking these raspberry sobet bellini’s long after Valentine’s Day or Galentine’s Day comes and goes. I think this is my new every Sunday brunch cocktail. 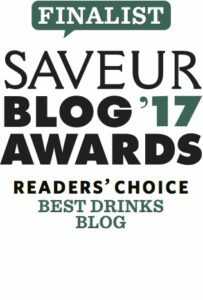 You can get creative and change what type of liqueur you use, the flavor of sorbet, as well as switch to a regular sparkling wine or champagne instead of rosé. ‘Tis the season for pink and red and I couldn’t help myself but pick raspberries and a little pink wine to go along with it. 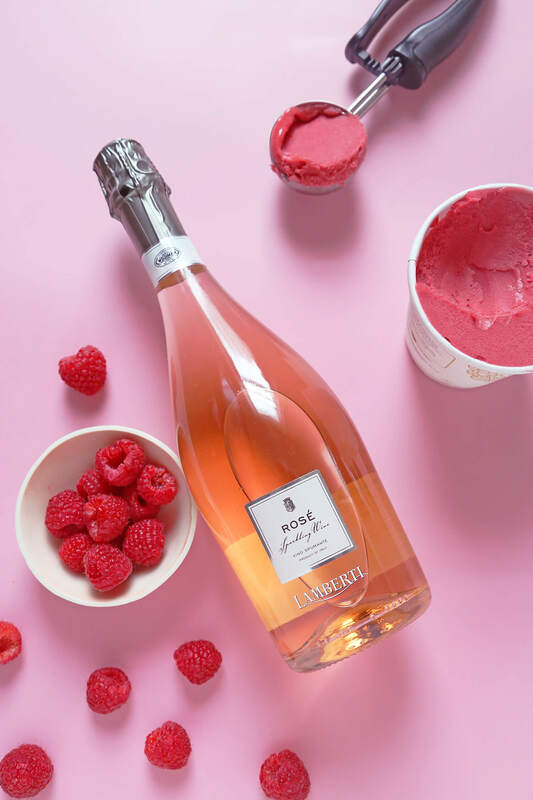 The Lamberti Rosé Sparkling wine I used was great for the price, bright, refreshing with lasting flavors of apple and raspberry that complemented the sorbet perfectly. I bet everyone is ready for Valentine’s Day…I know I sure am! 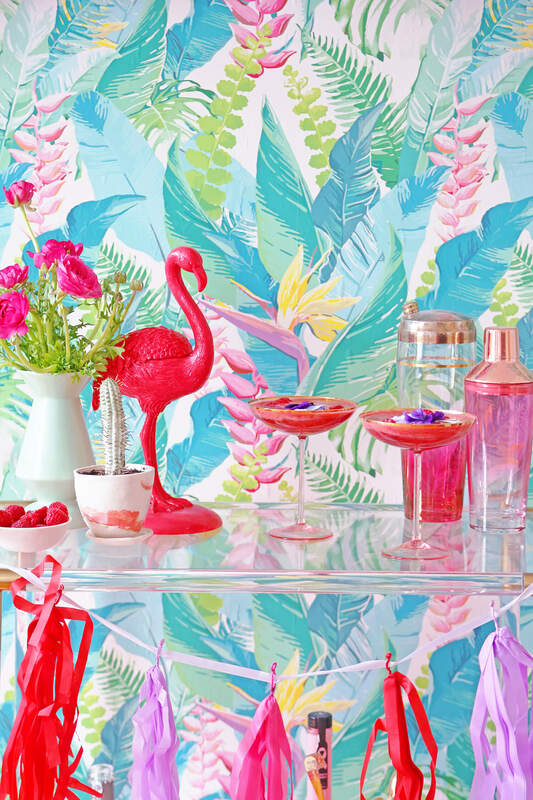 Whether you’re spending the weekend with you gal pals or getting ready for a romantic night out, a cocktail is always in order. That’s why I’m here! 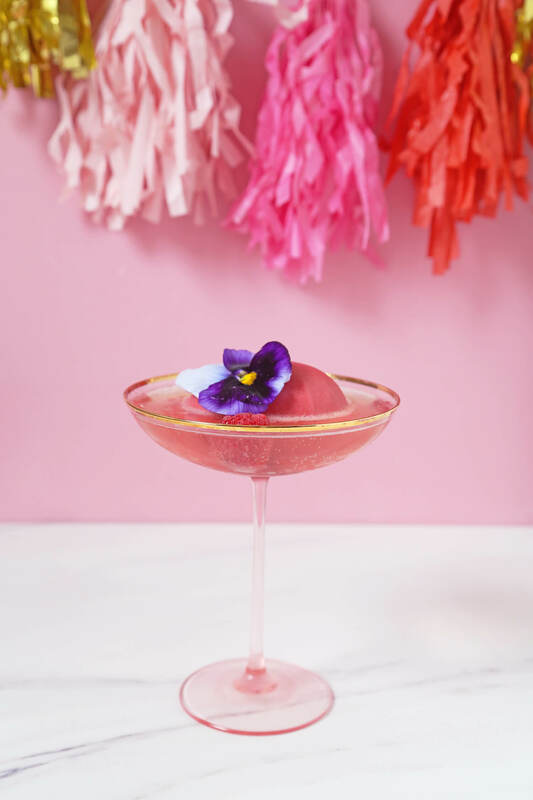 I’ve whipped up these super easy Negroni Floats that are perfect for your Galentine’s Day party or a romantic evening spent at home. They’re boozy, but with the addition of freshly whipped cream, they become a delicious alcoholic creamsicle. Now who doesn’t want one of those? Add all your ingredients to a mixing glass, add ice, and stir. If you’re making multiple drinks, double up or consider building in a pitcher. Strain into a coupe glass. Add 4 ounces of heavy cream to a tin with two sugar cubes and a very small piece of ice. Shake, shake, shake! You want to shake it till the sugar has dissolved and the cream is slighly thick but not pie topping thick. You want it to slide right over the top of the drink. I do this at work all the time with no trouble, with these the cream started to sink at a pretty fast rate. No problem! Just give it a little stir, it will only enhance the creamsicle effect. Garnish with a little zest of orange on top. Enjoy! Happy Valentine’s Day! Looking for Valentine’s Day ideas already? I hate to admit it, but it’s one of my favorite holidays, even if it’s kind of made up! 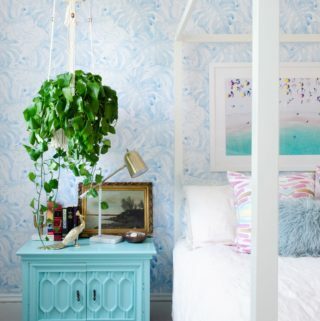 Anything that has to do with eating, drinking, chocolate, flowers and pink, I’m all about. Pink and red is one of my favorite color combos and this is the only time of year I can buy pretty much anything in that color scheme. You feel the same way, don’t you? If you’re looking for a tasty cocktail and a gift for her or him, look no further! I’ve teamed up with Jord Wood Watches to shake you up a delicious treat this Valentine’s Day. Jord makes beautiful wood timepieces that are very modern, stunning and completely unique. They offer many beautiful wood finishes and color options, and make both women’s watches and men’s watches. Moments are bigger than minutes and your watch should tell more than time. This Valentine’s Day is the perfect opportunity to show your loved one that your time, is and will always belong to them. There’s a contest going on to win a $100 to use on the Jord site. All you have to do is go here, and fill out of entry form. Contest closes 2/12. Good luck everyone! I have matched my drink to my watch with the Cora Zebrawood & Rosé. It has a beautiful light blush face that accents the wild and natural grain of the Zebrawood. I’m shaking up my Everything’s coming up Rosé cocktail that has Gin, Lillet Rosé, lemon, blood orange, and a hibiscus/passion fruit tea syrup. It’s sweet, floral, fruity, and slightly lower ABV, so you can have a few. Oh, and it’s this beautiful deep pink color. Perfect! Like Lillet Blanc, which you may be more familiar with, Lillet Rose is a wine-based aperitif, made from the Grand Cru Bordeaux grapes used for Lillet’s white and red versions, and then combined with fruit liqueurs. As a result it’s bright and fruit-forward but not overly sweet — a pleasure to sip on its own, or in cocktails. Since this cocktail is slightly lower ABV, if you want to kick it up a notch top it with Champagne. This would be a good batched drink for a punch bowl at your Galentine’s Day party as well. 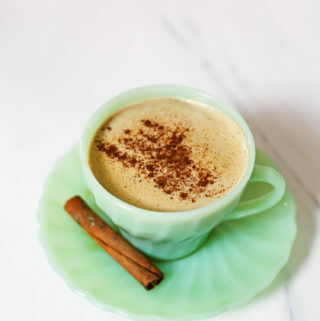 I used TAZO Passion for the tea syrup, I love using it in cocktails and it’s very easy to find. It is a blend of hibiscus, orange peel, rose hips, and passion fruit. 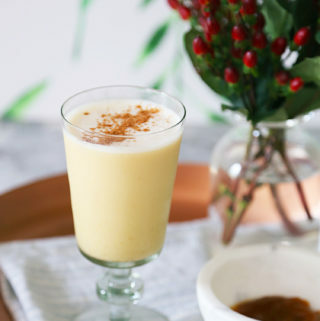 Very fruity, herbal and compliments the other flavors in this drink wonderfully. Combine all ingredients in tin, shake with ice, and strain into a coupe glass. If you want to dry this cocktail out a little and also add more ABV top with champagne. It will be delicious. For the tea syrup brew a cup of tea (8 oz.) and then add the same amount of sugar. If you’re making a larger batch you will have to add more tea bags.